REPRIEVE FOR UK BADGERS. CULL ON HOLD. IN IRELAND, BADGER MASSACRE CONTINUES. Mr Coveney said while nobody liked culling “we have a responsibility to protect our beef herds, in particular, and our dairy herds”. The culling programme had played “a significant and positive role” and only took place where there was believed to be a problem, he said. There are an estimated 80,000 to 90,000 badgers in the State and since 2000 the number of “reactors” – cattle that have failed the mandatory test for bovine TB – has fallen from 40,000 to 18,500. The Minister told Independent TD Maureen O’Sullivan that in Britain, which did not cull badgers now but would begin a pilot project in the autumn, the number of reactors had increased from 6,000 in 1999 to 33,000 in 2010. Field trials in badger vaccination were under way and, if successful, they would be incorporated in the eradication programme, Mr Coveney said. But “it will be some years before the trials are completed and targeted badger removals will continue in the medium term”. Ms O’Sullivan raised the issue during agriculture questions in the Dáil this week, pointing to the divergence between research cited by the Minister and research she had received from the Irish Wildlife Trust, “which shows culling of badgers has little or no effect on the eradication of TB and that it increased levels”. She pointed to findings that “even if all badgers in the country were removed the same levels of TB would remain”. Mr Coveney cited research carried out since 1989, including a project in four areas showing an improvement of almost 60 per cent following culling. Ms O’Sullivan expressed concern about the use of snares, which she said resulted in “extended periods of suffering for badgers, leaving the young unattended”. She asked how could “we as a humane country justify the use of such a cruel instrument”. She also spoke of arrests of people involved in badger baiting in Northern Ireland. The Minister acknowledged the need for a new approach to animal welfare, and said this would be evident from a new Bill he would publish soon. According to our only official badger survey carried out in Ireland a population of approximately 200,000 in the Republic was estimated with a further 50,000 in Northern Ireland. Today there’s less than half that figure. Nobody seems in any hurry to update our present badger population. Where have the badgers gone, Minister Coveney? The finger points directly at the Minister’s own Department’s mass eradication of the animal. Reactor removals (cattle who have failed the test for Bovine TB) rose again to a staggering 30,000 in 2008/09 which was higher than the previous decade despite the culling of more than 50,000 badgers in the intervening years. The badger casualties are likely to be much higher if we take account of illegal freelance killing on farmland. Cull not working, Minister? According to previous Minister, Mrs. Mary Coughlan, a grand total of 6,000 badger snares are set nightly across Irish farmland. It would appear according to a recent radio interview, our present Agriculture Minister has never actually seen a badger snare. It can be assumed that Mr. Coveney has also never seen a badger struggling in a wire snare that has a circumference of approximately 11- 12 inches. The fully grown animal has a girth of 18 inches and as a result suffers grievous internal injuries in its struggle to escape. To say that culling takes place only where’s there’s a “badger problem” is inaccurate. Culling is widespread and has been for more than two decades hence the urgent need for the aforementioned 6,000 nightly snare-setting operations. Badgerwatch will remind the Minister that he also has an obligation to protect our indigenous wildlife alongside the beef industry. The vast majority of badgers killed were healthy disease-free animals. To add to this there exists in this country no closed season on snaring. This leads to an unknown rate of orphaned, dependent cubs dying of starvation and hypothermia, underground. The Bern Convention and our own Wildlife Acts have truly failed the most abused animal that ever lived-the badger. 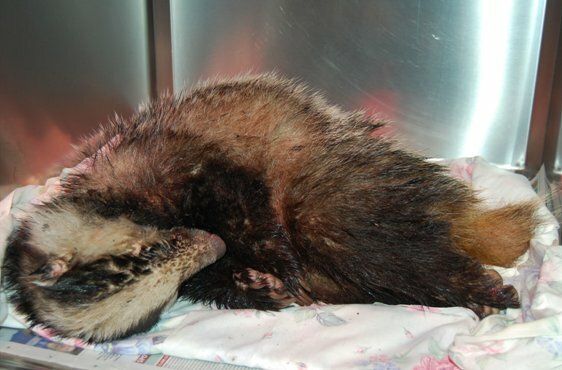 Injured badger was left lying in a stream for almost a week! Dan got the call about an injured/very ill badger that had been lying in the same location nearly a week. The lady only decided to call on the day. It was difficult to get to the spot as they had to get through a fence, over a ditch and attempt to reach the stream. The unfortunate animal was lying half ways into the stream. Rushed him straight to the vets where he was immediately treated for shock, dehydration and had three puncture wounds which were extremely infected. Despite the best efforts from all concerned with its rescue, the animal succumbed to it’s injuries at the vets. It is likely that it’s chances of recovery would have been so much better if help had been sought sooner. Why some leave it till the last minute to report an animal in distress is difficult to comprehend. It’s all about getting help as quickly as possible. If you come upon an injured animal please do not delay in seeking help. It can be a matter of life or death for the animal. The statement by the Secretary of State for the Environment, Food and Rural Affairs confirming the postponement of the proposed badger cull contained a shameful series of evasions and errors in seeking to justify the killing of badgers and the impractical methods the Coalition proposes to use. Nevertheless, the Badger Trust still hopes the Government will consider more carefully all the new issues that have emerged over the last few months. The Trust calls for an open and transparent public review of all the issues including the costs, public safety, practicability, science, animal welfare and the emergence of alternatives to culling. Informed scientific opinion seeks a national bTB eradication strategy which would make clear the miniscule contribution and considerable dangers to be expected from culling. The Badger Trust puts some of Owen Patterson’s remarks into perspective. There is no evidence that the badger population has increased since the last estimate in 1997. He claimed the Government had devised a much more effective culling method -- one that has never been tried and which they need pilot culls to test. Britain enjoyed 20 years with about 1,000 cattle slaughtered annually. The number rose when testing was disrupted by BSE and foot and mouth, but for 16 years the industry stood out against pre-movement testing. Ten times as many cattle are killed for diseases other than bovine TB. Compensation is paid for the TB-infected cattle, but not for the others. In saying no other country had tackled bTB without addressing wildlife Mr Paterson, his predecessor and the farming organisations have forgotten that the United Kingdom did so after World War II, bringing the cattle toll down from 47,476 to a low point of 628 in 1979, without killing badgers. Bovine TB is not currently spreading. In fact the number of cattle lost – and compensated for – has been falling from 2008 up to last year. The disease is not being “left unchecked”. A new range of long-awaited and overdue farm-based measures have finally been announced for next year. Marksmen shooting badgers at night will have to kill at least seven out of ten – but the Coalition has no idea how many badgers there are in the first place. Other species do not have to be culled to a specified minimum. Keep the public safe despite the secrecy about boundaries. How to find the badgers and achieve sufficient ‘humane’ kills. Get the farmers to pay up for what promise to be ever-escalating bills. How to keep the shooting, the identity of participating famers and landowners secret from criminal activity by protesters. Farmers and landowners have been sadly deluded into believing in - and paying for - the proposed unholy mess based on a 40-year-old prejudice impervious to science. Agriculture Minister Michelle O’Neill, today announced her plans for actions on TB and wildlife. Addressing the Agriculture and Rural Development Committee she stated that eradication of bovine TB remains a top priority. The Minister acknowledged the adverse impact this disease has on family farm businesses and paid tribute to the positive input of local farmers and private veterinary practitioners in relation to TB testing. She said: “Whilst TB is a very complex, multi-factorial and challenging disease, I am convinced we can do more on top of our existing programme to reduce levels of TB here. 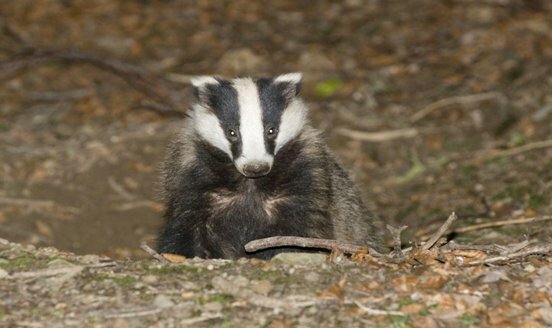 “Following recent discussions with industry stakeholders and informed by the views of the external experts who attended the International Vaccination Symposium here in May, I have asked my officials to design specific wildlife intervention research.” The Minister advised that she had tasked her officials to develop an approach that would involve testing live badgers; vaccinating and releasing the test negative badgers; and removing the test positive ones. The Minister advised that the aim of this wildlife intervention research would be to test the effectiveness of this approach on the level of TB in badgers and in cattle in the north. This approach has not been tried anywhere else and may offer an advantage in moving forward as part of a comprehensive approach that addresses all the factors involved in TB spread. The Minister added: “I am also asking my officials to maintain and develop stakeholder engagement with farming, veterinary and environmental representative organisations as the research proposal is developed over coming months. “Timing of the start of any field work is dependent on the successful completion of the necessary preparatory actions, but I hope it will be as early as possible next year." Any proposal for wildlife intervention research will be subject to the necessary business case, the issue of the necessary licences and must comply with the relevant legislation. The Welsh government has dropped plans to cull badgers as part of an attempt to wipe out bovine TB in cattle. Environment Minister John Griffiths said he had instead opted to vaccinate the animals after carefully considering the scientific evidence. The cull was put on hold and a review of the science involved in controlling bovine TB was commissioned after last year's assembly elections. The previous government had planned a pilot cull of badgers in west Wales. Mr Griffiths scrapped the plan, saying a five-year vaccination programme will start in the intensive action area - the TB hotspot in north Pembrokeshire where the cull was due to take place. The announcement will disappoint g unions and Labour's political opponents who strongly backed the cull. Mr Griffiths said he remained committed to eradicating a "terrible disease" that had "devastating" consequences. "I have visited and spoken to a number of cattle farming families across Wales," he said. "I know from listening just how difficult it is and how the consequences of TB can be devastating." Deciding to cull would have to be justified on the basis that it was necessary to substantially reduce bovine TB in cattle, he told AMs in the Senedd chamber. "At present I am not satisfied that a cull of badgers would be necessary to bring about a substantial reduction in cases of TB in cattle," Mr Griffiths added. The cull was drawn up under the previous Labour-Plaid coalition Welsh government. At last May's election, Labour said it would take a science-led approach to the policy.